Another work featured in BYO at PAULNACHE in Gisborne. 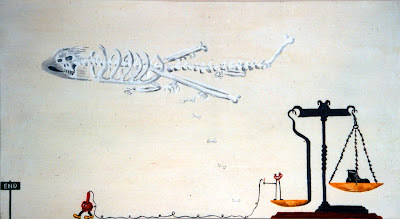 This work is called Revenge and was painted in 2000. It was originally exhibited at Janne Land Gallery in a solo exhibition called Panoramas and Painted Objects in 2001. You can see this painting in the exhibtion here, just click on the image and it's situated just above the Dog paintings on the palette in the middle bottom of the photograph.